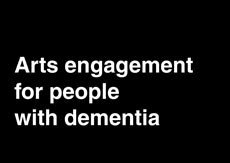 The study, Arts engagement for people with dementia by Dr Gail Kenning PhD, University of Technology, Sydney, was commissioned by the Gallery in 2015. Alzheimer’s Australia NSW supports the UTS findings as they provide a valuable evidence-base for the outcomes of such programming. Dr Kenning said the study involved both qualitative and quantitative research to gain an understanding of the impact of the arts access program for people living with dementia. “While dementia impacts cognitive and physical functioning and memory, consciousness and emotions remain intact. This means people living with dementia show affective responses and can experience the pleasure of looking at and talking about art,” Dr Kenning said. “This study did not focus on memory, and whether people living with dementia remembered their engagement with art, but recognised the positive impact of ‘in the moment’ pleasure of experiencing art and of feeling valued, supported, acknowledged, and challenged. This experience of pleasure impacted people with dementia as well as carers and family members,” Dr Kenning added. Artworks selected for the study by Danielle Gullotta, AGNSW access program coordinator, include iconic Australian masterpieces, works from international touring exhibitions, award-winning works from annual exhibitions such as the Archibald, Wynne and Sulman Prizes and AGNSW collection ‘audience favourites’ such as Elioth Gruner’s Spring frost (1919). Gullotta said it is a privilege to spend time viewing and discussing art with people who are living with dementia. “Participants have an opportunity for meaningful and interactive engagement with art and are invited to imagine and think creatively in a safe environment. “Guides encourage self-expression where participants’ curiosity is stimulated through focused observation, group discussion and personal connections,” Gullotta said. The Art Gallery of NSW head of learning and participation, Heather Whitely, said the Gallery places great importance on the work it undertakes to contribute to the health and wellbeing of people living with specific needs. “The transformative nature of art engagement for people with specific needs cannot be underestimated,” Whitely said. Recent research has indicated that social isolation and loneliness are the most significant issues people face once diagnosed with dementia. Dementia Awareness Month raises awareness about the support and services available for people living with dementia. 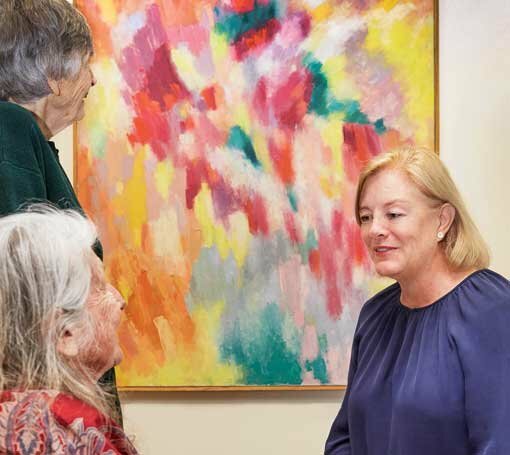 Alzheimer’s Australia NSW CEO, the Honourable John Watkins AM, said the Art Gallery of New South Wales’s arts access programming is a wonderful example of a social support available to people living with dementia and their carers. “The theme of Dementia Awareness Month is ‘You are not alone’ and the Gallery’s art and dementia programming certainly underlines this message,” the Hon Watkins said. “Art access programs at the Art Gallery of NSW are world-class, providing a pleasurable – and often joyful – experience for people with dementia and their carers and families. “AGNSW art access programming provides a much-needed respite from the day-to-day realities of living with dementia and caring for someone who has dementia – with obvious ongoing benefits for everyone taking part,” the Hon Watkins added. The Art Gallery of New South Wales gratefully acknowledges the support of State Street and Alzheimer’s Australia NSW. As principal sponsor of the art and dementia program in 2015, State Street supported the funding of this valuable research. Alzheimer’s Australia NSW provided support and training in the initial establishment of the program. Ongoing support for the Gallery’s art and dementia programming is also provided by a generous donor who would like to remain anonymous. 2015 saw the Art Gallery of New South Wales, considered one of Australia’s leading arts access institutions, cater for the largest ever numbers of people taking part in art access programs, provided by the Gallery since 2010. Through education and access programs, the Art Gallery of New South Wales aims to break down social barriers and promote inclusion for people with different physical, sensory, and intellectual needs and enable disadvantaged community groups to actively engage and connect with art. The evaluation model used in the AGNSW study will contribute to a growing body of research that focuses on the extent to which the lives of people living with dementia can be enriched through the stimulation that engaging with the visual arts can provide, and will help inform wider implementation of inclusive programs for people living with dementia. Normalcy is achieved by taking into account differences in ability, neural diversity, and social and cultural backgrounds, providing different experiences for different people. Findings show the Art Gallery of NSW access programs are flexible and adaptive, suitable to a wide range of conditions and abilities, providing varied experiences for “in the moment” pleasure that contributes to wellbeing. The overall importance of context is a key finding of this study. Visits to the Gallery by people with dementia and their carers and family members can be impacted by “operational matters” such as travel to and from the Gallery; availability of seating in front of works of art at the Gallery; noise levels etc. Heightened attention to operational matters by experienced AGNSW facilitators giving careful consideration to these matters made a positive contribution to the program. Dr Gail Kenning BA Hons, MA, PhD is a researcher in the Faculty of Arts and Social Sciences at the University of Technology, Sydney. She is a trained practising artist. At UTS she specialises in working with health professionals involved in policy, wellbeing, and the culture and humanities of health. She has recently undertaken art projects related to health and wellbeing of people with dementia in conjunction with Alzheimer’s Australia and the Powerhouse Museum and was recently appointed Honorary Reader in Design for Ageing and Dementia at Cardiff Metropolitan University, Wales. Alzheimer’s Australia NSW is the charity for people with dementia and their families and carers. As the peak body, it provides advocacy, support services, education and information. An estimated 353,800 people have dementia in Australia. This number is projected to reach more than half a million by 2030. The National Dementia Helpline is an Australian Government Initiative. Dementia Awareness Month is supported financially by the Australian Government and the NSW Government.